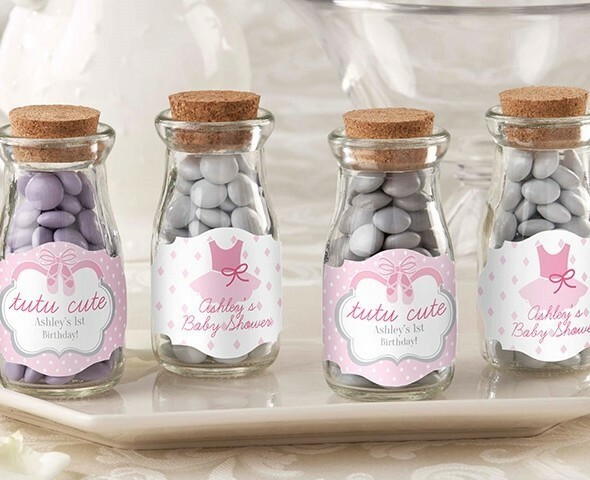 Offer something truly unique to your ballerina-themed baby shower or child's birthday party guests with these personalized milk bottle jars customized with pink-and-white stickers in your choice of a mini tutu design or a pair of ballet shoes motif and two lines of your own text. Each nostalgic miniature milk bottle jar features a real cork top and large, easy-access opening. PLEASE NOTE: Personalized labels arrive unattached from the jars, so some assembly is required. Sold as a set of 12 and prices quoted below are per set. Due to personalization, the minimum order quantity is two (2) sets of 12.